This entry was written by Tomás, posted on 23 May, 2009. Filed under In general and tagged Bruno Latour, complexity, design, Edgar Morin, Horst Rittel, Richard Buchanan, wicked problems. Daniel Pink is an american author who has been writing about Design and the right-brainers. On his book –A whole new mind. 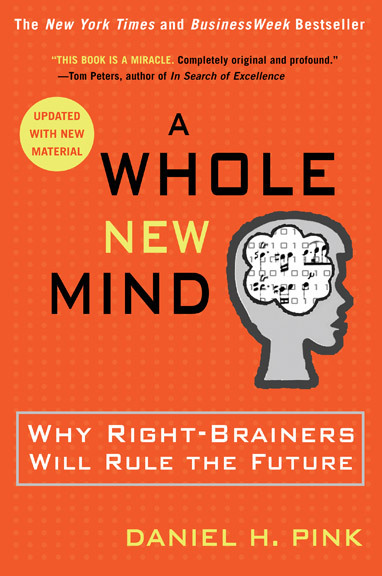 Why right-brainers will rule the future– he argues about the idea that lawers, accountants or computer programmers (“what our parents encouraged us to become…”, he said) are the professions that represents an old era dominated by ‘left-brainers’ and that the future belongs to “another kind of person with a different kind of mind”. If you look at the problems we’re facing—the big problems, not the problem of, you know, is company X going to stay in business tomorrow or is someone going to meet their numbers next quarter—if you look at the big problems, they’re design problems. I don’t mean that everybody has to be a great designer, but everyone has to be literate in it. In the same way I consider it up there with numeracy. That is, to be in business, let alone to be a fully-functioning member of a democratic society, you have to be numerate, you have to know a little math. I think the same thing is true now about design thinking: You don’t have to be a great designer, but you have to be design-literate.